This is actually a sequel to the Cats & Dogs released in 2001 and after watching this one, I didn’t feel like knowing anything about the first one. It’s yet another one of those comedies where I had to, you know, laugh at a little just to not be the weird one in the crowd. But I don’t know, maybe I’m too old for this. Probably kids and teenagers would find this entertaining. However, I asked myself, if I was younger, would I’ve liked this? Hmmm… no. Anyway, if you wanna know the sypnosis, read this paragraph or else, just skip it. 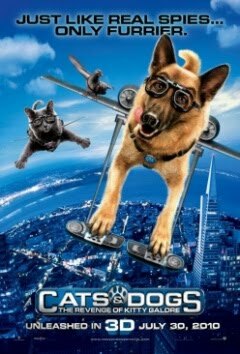 The animals in this film can actually speak in English and the cats & dogs each have their own secret high-tech society for their war against each other, and also to protect humans from threats as well. Instead of going at each other, the two species now have to work together to take down a nemesis called Kitty Galore, a cat that wants to turn the dogs in the world into mad dogs before enslaving all humans. Verdict: A family-oriented film that’s predictable, exaggerating and annoying. Would’ve probably been much better if the animals do not talk at all. Nostalgia: There’s a 3D animated short film of Wile E. Coyote and Road Runner right before the movie begins. My friend & I were like, “Ohhhh I miss this!” We wondered if the younger people in there actually know how great this cartoon was back then in our childhood days. This simple little 5 minute (or so) short was more entertaining than the whole movie that we were about to watch. It’s ironic if you think about it. Seriously it's a disappointing movie. lol..u too old liao lah~!! kekekeke..